Yes, it's a simple wrap, but it's packed with flavour. I spread good quality flour tortilla wraps (I like Mission Deli Wheat and White) with a thick layer of creamy hummus, topped it with a generous layer of fresh spinach, then I topped the spinach with grated carrots and chopped salted cashew nuts. See I told you it was simple, but the flavours sing when they are eaten together. You can use homemade hummus in this wrap if you have some in the fridge or if you have a few minutes to make some, if not shop bought hummus is great in this wrap. It's my new title. Some of my readers have started calling me that. I think that's because I've shared so many wraps and sandwiches with you recently. In April I shared a spicy bean lunch wrap which is a copycat recipe. It's a vegan version of a veggie wrap that Tesco sell. In March I shared a recipe for roasted vegetable and tofu sandwiches which were rather special and also some sensationally green edamame and pea falafel which are the perfect filling for wraps. In February I made and shared beet salad lunch wraps, which you all loved and some vegan chilli mince dinner wraps that my family have been enjoying for years. In January I made spiced tofu and mushroom tacos which were yummy and I think we can safely class as wraps. Oh and I also shared how to easily turn flour tortillas into fresh, crisp tacos, so do check that out if you don't make your own already. In November I shared a tasty spiced chickpea and carrot sandwich filling which has been extremely popular. So you can see how I gained the title Queen of Sandwiches. This wrap provides protein, iron, potassium and calcium. 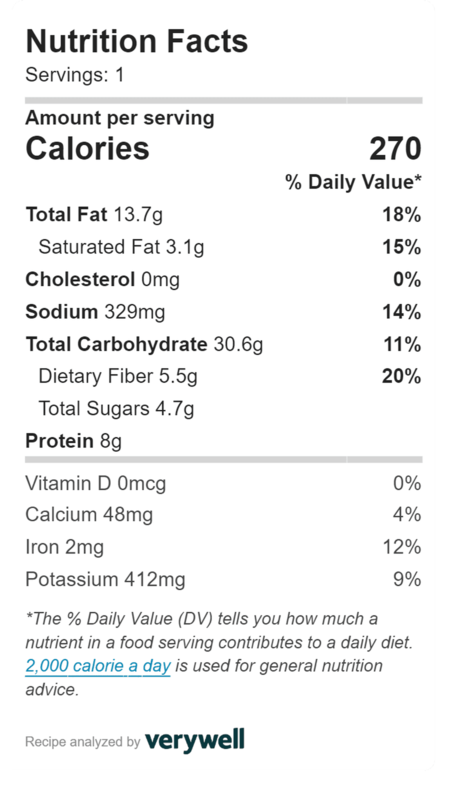 It's only 270 calories and 3.1g saturated fat. I had a look at the 8 wraps a leading supermarket sells to compare them to mine. Here's what I found out. Supermarket wraps - between 6.4g to (a whopping) 16.1g. It's healthier and over the course of a week much cheaper to make your own. 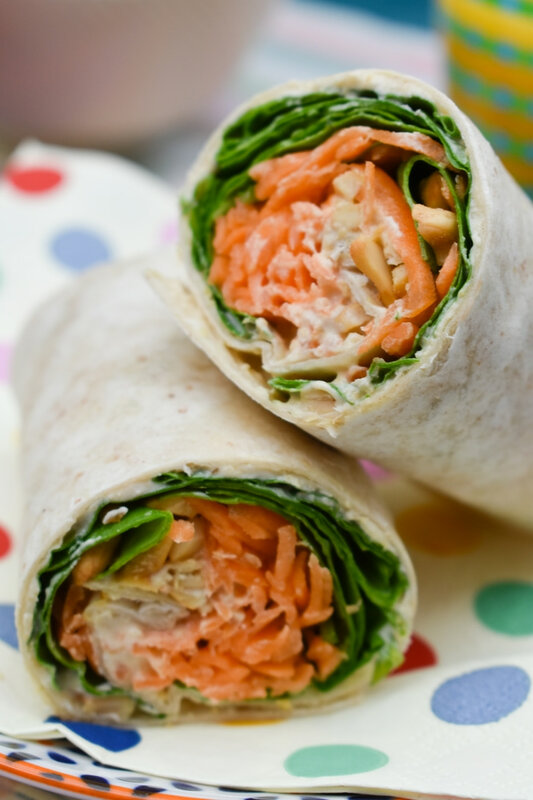 A delicious vegan lunhctime wrap full of colourful veggies and finished with the crunch that makes this wrap one of the best wraps around. Peel your carrot, then grate coarsely. Spread your tortilla with hummus, then lay the spinach across the middle of the wrap, top with the grated carrot and nuts. To wrap your tortilla, fold in the sides, roll the top of the tortilla towards you wrapping it firmly around the filling, tucking in the edges as you go. 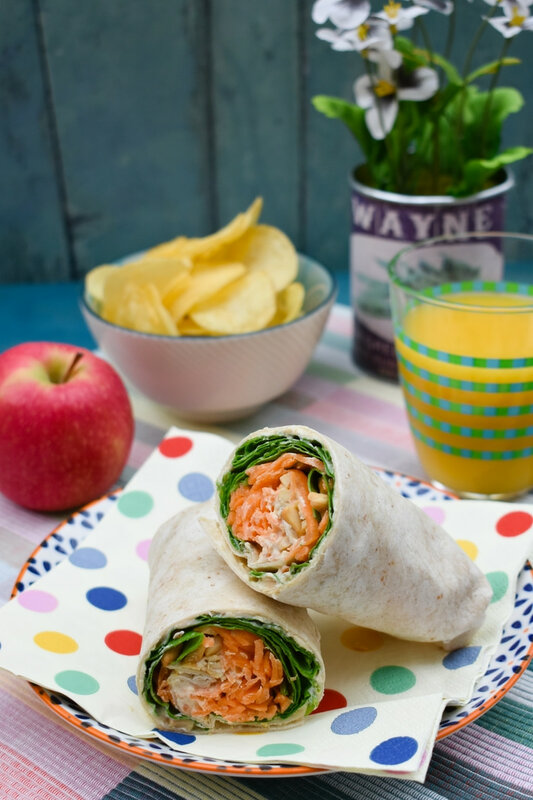 Cut your wrap in half and serve with a few crisps (chips) and some apple wedges, with some dressed salad or wrapped in foil if you are on the go. Remember to follow me on pinterest and do use that pinterest app to share photos of your wrap. Just pin one of the photos in the post and then hit the add photo button. For more lunch inspiration follow my boards sandwiches - vegetarian and vegan recipes, lunch wraps (veggie & Vegan) and picnic recipes (vegetarian & vegan). If you would like to receive my recipes by email, scroll down to the bottom of the page where you will see a small form, just add your email and hit submit. As per GDPR (the new data regulations) I would like to assure you that I do not share your email and will not contact you by email personally. You will only receive my posts by email, which will be pulled from my RSS feed. 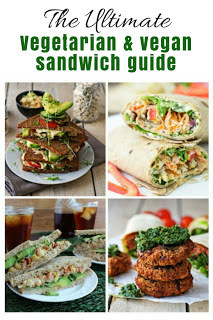 If you liked this recipe, but want more lunchbox inspiration, check out my ultimate vegetarian and vegan sandwich guide. I love this sort of sandwich but would not think to add nuts - it does sound like it ramps it up a notch. When I was a kid I really loved vegemite and walnut sandwiches - that is my comfort food these days. It works so well Johanna, I think you will like them, although actually I am sure you said over on Facebook you have tried this filling as a sandwich and loved it. 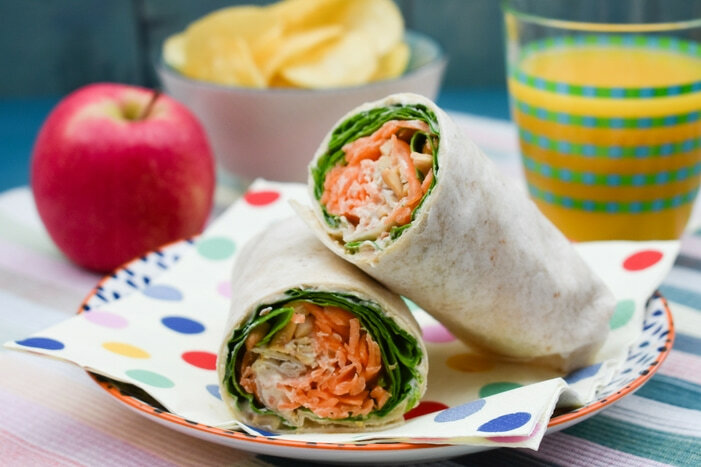 This is a great wrap when looking for a light lunch. Pair with fruit and you are good to go. Oh yes definitely. You could manage your five a day in one sitting. I hadn't thought of using carrots in my wraps but that sounds delicious. Love the crunch and the flavors! Oh yes you definitely should, they are great in wraps. So simple and healthy! I will have to send my husband to work with these! 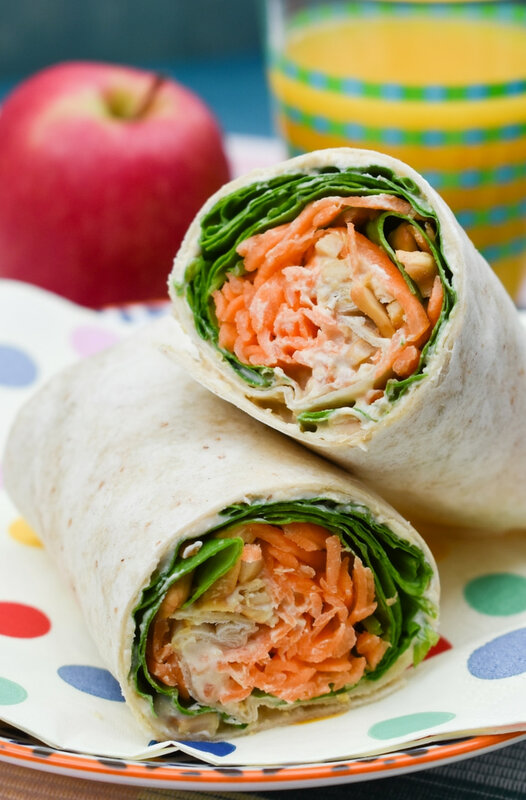 These wraps are absolutely delicious! Wonderful job at making me crave for this fresh and amazing recipe! Oh yes, it would be good with some sort of dipping sauce or maybe some mango chutney added to the wrap! Queen of sandwiches? Excellent title. You're very good at it. This one reminds me of the only vegetarian sandwich I could get at work back in the 90s - it was a carrot and peanut one. I ate quite a lot of them. Haha yes I'll accept it. I have another one up my sleeve I will be trying soon. That sounds like a pretty darn good sandwich for the 90s! I made this wrap for my lunch yesterday! I just happened to have all the ingredients on hand. The only thing i added was a little bit of Spring onion ( just because i had some languishing in the fridge that had to be used up ) and it was SO good !! ♥ made two small wraps to take to work and i was so sad when it was all gone , I seriously could have eaten 6 of them .. Ha Ha . I am so glad you enjoyed it. I gave to admit it's one of my favourites too. Such good flavours. I used to make sandwiches with jyst grated carrot and hummus, but this is much better.